Wright Brothers 1901 Wind Tunnel (replica). Image source: National Museum of the U.S. Air Force, public domain. The Wright Brothers pioneered wind tunnel research in Ohio. From 1900-1902 they tested various unpowered aircraft to develop their knowledge of how flight control systems work. A wind tunnel at Wright Field in Dayton, completed in 1921, was the prototype for other modern aircraft testing facilities around the world. To simulate flight conditions, Wilbur and Orville tested small model wings in a wind tunnel they had built. The wind tunnel was a box with a fan at one end that blew a steady stream of air over model wings mounted on a special "balance" inside the tunnel. Using this device, the brothers were able to gather information that could be used to design the wings of the gliders and powered aircraft that would carry them into the air. The wind tunnel provided them with information on the most satisfactory wing shape. It also enabled them to calculate the size of wing that would be required to lift them into the air, the performance of their propellers, and the amount of power that their engine would have to produce. Common Research Wind Tunnel Model at NASA Ames Research Center. Image source: NASA. Sometimes scientists create a model to help them explain how or why something works the way it does. In aeronautics, researchers and engineers use models to design and modify airplanes. Aeronautical researchers can make a scale model and mount it in a wind tunnel. A wind tunnel is a tube or tunnel through which air is blown. So, instead of an airplane flying through the air, a scale model of the airplane is mounted in a wind tunnel and air is blown around it. Some wind tunnels are very large and can hold models that are the size of the real airplane. Some wind tunnels are very small and can only hold very tiny scale models of the airplane, or maybe a scale model of a part of the airplane. Some very small wind tunnels can blow air only at very high speeds, which can exceed 3,000 miles per hour (mph). Some of the largest tunnels blow air at less than 150 mph. It may sound slow, but many airplanes take off and land at that speed. Big, slow wind tunnels thus are very useful. Over the years, NASA's Ames Research Center in California has operated more than 20 wind tunnels of varying sizes and purposes. Technology has come a long way since the Wright brothers' early methods, but NASA engineers still use models and wind tunnels to improve the flight control of sophisticated aircraft. 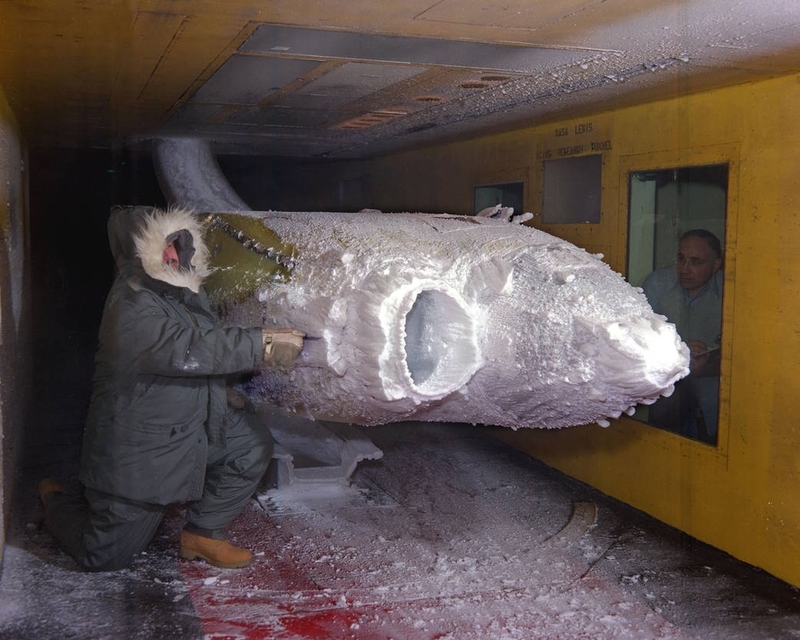 The world’s first refrigerated icing wind tunnel went into operation near Cleveland in 1944, and remains the world’s largest. The NASA Glenn Icing Research Tunnel (IRT) was built at the end of World War II, and was instrumental in developing and testing ice protection systems for piston- and propeller-driven aircraft. Since that time, the IRT has been updated with a larger fan motor, improved fan blades, computerized tunnel controls, and electronic data acquisition, storage, and processing.